Singapore is a heavily fusion-ized city-state, and you can find food from all over the world here. Luckily for us, we met up with a college friend who lives in Singapore. I confess, I had no idea what Singaporean food meant or what to expect, so with her as our guide, we tried a local favorite, signature Singaporean dish–chili crab (pictured in feature photo)! The results was delicious: steamed crab with lots of sweet and spicy chili sauce and a side dish of stir-fried morning glories, which are popular in Thailand, too. My favorite of the three for flavorful, comforting, and cheap food. I love Thai food in general, so eating here was a real treat. The best meal I had was pork leg at a street stall we stumbled upon while we wandered around Phuket. The place was packed with locals and served only one dish – a sure sign of success. Another favorite is the fresh coconuts. After a hot morning at the beach or on tour, coconut water is a big help for cooling down and re-hydrating. The soft, chewy coconut meat took me a while to get used to, since I’ve only ever tried dried coconut flakes, but it grew on me and I began to seek it out by the end of our time in Thailand. On an elephant trek, our tour guides gave us fresh local fruits: oranges, round, sweet longan (similar to lychees), rose apples, and purple dragon fruit; and sweet snacks from the local morning market, made to order: fried dough or steamed sticky rice, both in coconut milk, and wrapped in banana leaves. And then there were the Thai staples: seafood fried rice served in a pineapple, pad Thai, pad see ew (locally called fried wide noodles) and khao soi, a signature soup noodle dish from Northern Thailand. Northern Thai khao soi noodle soup. While on the beaches of Thailand, I enjoyed delicious seafood, the best of which was the fresh fish in sweet chili sauce. Eggs are a cheap protein, so you’ll find a lot in Thai food. Eggs are commonly sold in markets, and they’re very fresh. While in Rome, I ordered an omelette! I spent most of my time in Vietnam on a cruise ship in Halong Bay, so the food we had was Western-style seafood. Very delicious, but I won’t feature it here. The chef does deserve extra kudos, however, for his carving skills. A watermelon carved in the shape of our cruise ship. The best things I had in Vietnam was again, the street food! 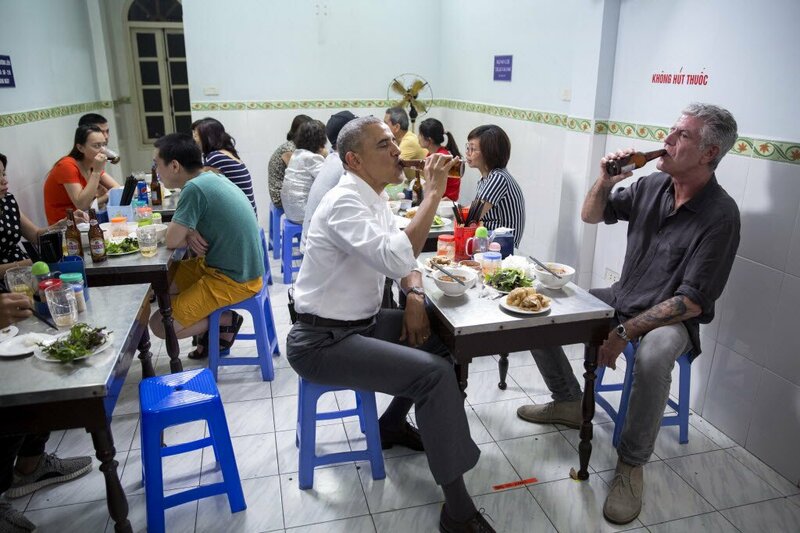 We just followed the crowds, and voila – ended up trying delicious pork noodle soup and beef pho in modest street shops à la former US President Barrack Obama and late Parts Unknown host Anthony Bourdain.